When I have read almost 30 books in series that are linked and I keep coming back for more you know they are good books. Especially when I have rated almost all of them 5 out of 5 stars. I read this one a while back but somehow forgot to review it. So I gave it a quick reread so I could write this review. The book was just as fun the second time through. 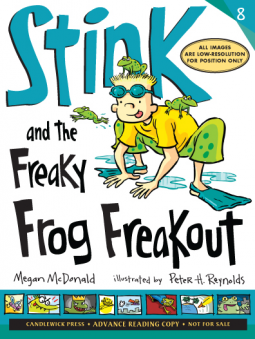 This book has a lot of information about frogs, if you were not freaky for them before reading the book, like Stink you might become freaky for them. 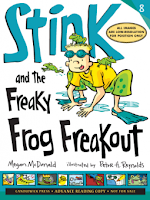 Stink is struggling with his swimming but after a close encounter with a blue frog he feels some changes come over himself. Combine that with a trip to the nature center and Stink becomes even weirder than usual. Another great read from McDonald and Reynolds. Other exciting news there is a new series out of shorter books in the Judy Moody and Friends series they should be an interesting edition to the Moody books.